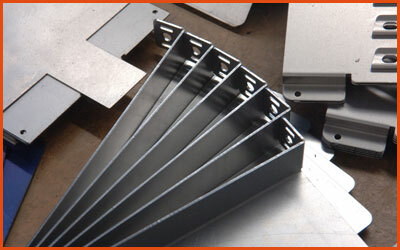 What type of sheet metal parts and blanks do you need? We can manufacture parts and blanks based on nearly any concept, drawing, or physical example to your design specifications. We can create the most complicated shapes out of many different materials because of our technology, advanced equipment and experienced staff. Since we have the most modern equipment to punch, form, perforate, weld, laser cut, custom tool and stamp metal, our fabricated metal parts and blanks can be produced quickly, to a very high quality, and to your unique specifications. We have the flexibility of running parts and blanks on our new Amada FLCAJ 3015 3-Axis Fiber Laser Cutting System and Amada HDS 1303NT- 143 ton - 8 axis CNC – and both systems are setup to run around the clock, seven days a week, with lights out, allowing to offer fast lead times and better pricing. 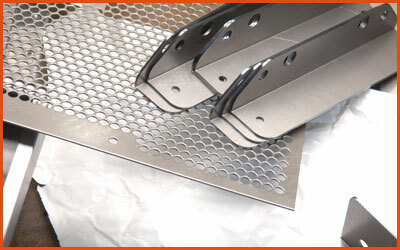 Do you need perforated metal parts and blanks? 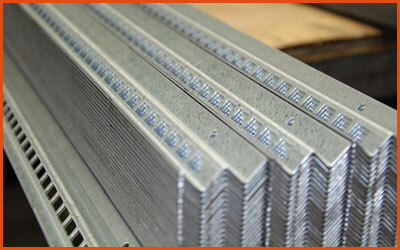 We also have the capability to perforate parts and blanks from most metals and then fabricate into most shapes. We can perform metal fabrications with a range as light as 28 gauge up to 3/8 inch thickness. Whether you need a metal diffuser screen to precisely fit inside a lighting fixture or perforated blanks for ventilation, we can supply them. We have dozens of perforating presses, hundreds of perforation tools in stock, and thousands of perforation patterns to choose from. We have the capability of creating margins on the sides and edges, plus pulling pins internally and advanced the feed of the material on the press automatically in order to offer a myriad of internal and external margin options. We can then quick chop out parts and blanks from the perforated sheet one of our turret press or laser cutting system, which typically is far less expensive and better quality than performing all operation separately on laser cutter or turret press alone.